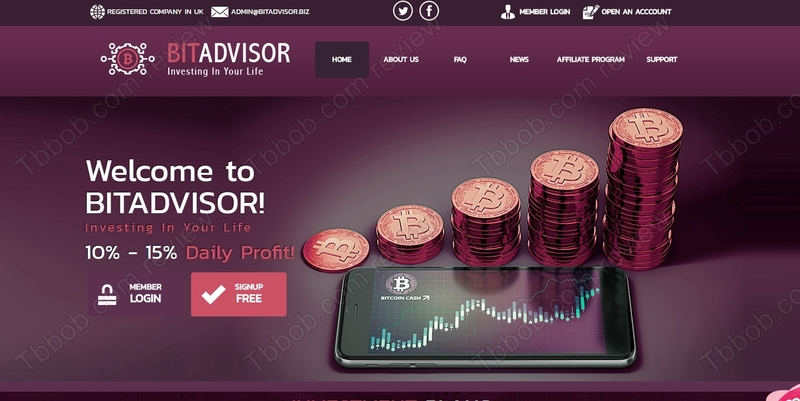 This review is about a new cryptocurrency scam called Bitadvisor. Bitadvisor is supposed to be an investment project that makes money in crypto mining. You deposit money, Bitadvisor uses it for mining and pay you profits. Investment plans offer up to 15% daily forever. Is it really possible? The reality is that Bitadvisor is not mining cryptocurrencies, it is just a scam. We can say it just by looking at the numbers, 15% daily or 450% monthly is absolutely impossible in mining. In fact, because of the recent price drops Bitcoin mining is barely profitable these days. But even when prices were at all time highs, you could not make 15% daily, this was and probably will never be possible in crypto mining. Bitadvisor is proudly displaying a company registration from the UK. But you have to realize that it is just a tax registration that almost anybody can get and that it is only a few weeks old. A company providing investment service has to have a licence from the Financial Conduct Authority, but as you can see on our picture, Bitadvisor doesn’t have it. It means that it is acting illegally. Bitadvisor is in reality a Ponzi scheme. This means that at the beginning they might pay some profits, but they will use new deposits for that purpose. No real business activity is going on, just an illegal financial game. These schemes usually last only a few days or weeks, than they collapse and all the money gets lost. BitAdvisor is a scam, a Ponzi scheme that will lose a lot of money. Stay away from it! It is almost impossible to make money in mining these days, you can try cryptocurrency trading instead. There is a free demo available for you to try. But remember that in trading you make, but also lose money, so act responsibly.